I have been planning this meal for some time. It’s one of our favorites and I haven’t been able to make it for several months. Pot pies don’t go well with nasty, humid weather. Fall is my very favorite time of year because it goes hand in hand with comfort foods. It would be nice if the weather would cooperate with the time of year! Oh, to live in a place with four distinct seasons…I have yet to know what that is like. Although, areas where there is an actual visible transition into Fall usually equals really cold and long winters…I couldn’t handle that. I get cold when it’s below 75 degrees! I used two different recipes to make this pot pie – one from Food.com and the other is an Ina Garten recipe. This is my first attempt at making pastry dough. The food processor makes it super quick and easy, but as with most types of dough, this one can be a little fussy. Everything has to be ice-cold and you can’t over work it or it will become tough. Of course I could have just picked up store-bought pie dough today, but I like the challenge because lately I have really enjoyed making as many meals from scratch as possible. The pastry dough turned out so flaky and flavorful – there is nothing better than a first try turning out well. Everyone enjoyed this, even S told me “thank you” tonight – she’s my picky eater. I know this recipe has lots of steps, but take the help where you can get it – buy a rotisserie chicken and pre-made pie dough. Thanks for reading, enjoy! Place the chicken breasts on a baking sheet and rub them with olive oil. Sprinkle generously with salt and pepper. Roast for 35 to 40 minutes, or until cooked through. Set aside until cool enough to handle, then remove the meat from the bones and discard the skin. Shred or dice the chicken. You will have 4 to 6 cups of cubed chicken. For the pastry, mix the flour, salt, and baking powder in the bowl of a food processor fitted with a metal blade. Add the shortening and butter and mix quickly with your fingers until each piece is coated with flour. Pulse 10 times, or until the fat is the size of peas. With the motor running, add the ice water; process only enough to moisten the dough and have it just come together. Dump the dough out onto a floured board and knead quickly into a ball. Wrap the dough in plastic and allow it to rest in the refrigerator for at least 30 minutes. Preheat oven to 375°F. Saute onion, celery, carrots and potatoes in butter for about 10 minutes. Add flour to sautéed mixture, stirring well. 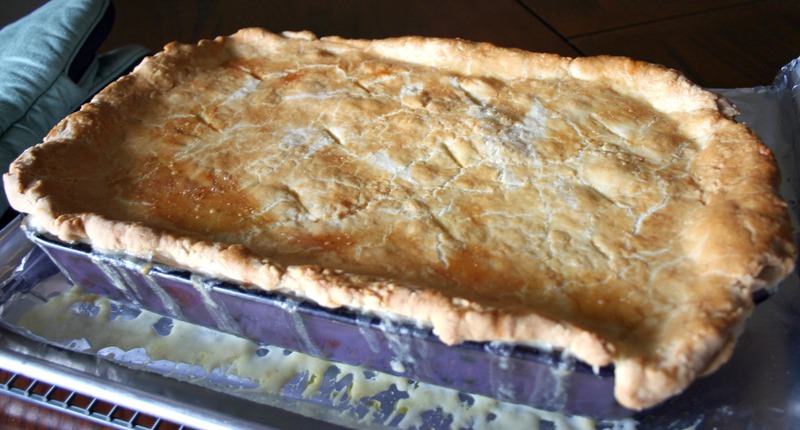 Cook one minute stirring constantly.Combine broth and half and half.Gradually stir into vegetable mixture.Cook over medium heat stirring constantly until thickened and bubbly.Stir in salt and pepper; add chicken and stir well.Pour into one 13 x 9 casserole dish and top with pastry dough. Cut slits to allow steam to escape. Bake for 40 to 50 minutes until pastry is golden brown and filling is bubbly.